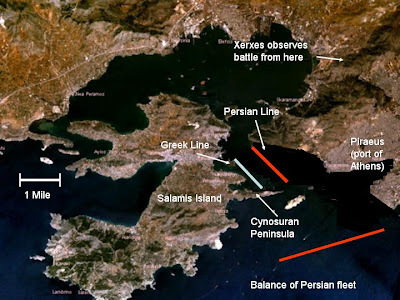 The Battle of Salamis occurred in 480 B.C. when the Persian King Xerxes attempted to push south into the Peloponnese Peninsula. As I discussed in a previous article, the Spartans were hesitant to engage the Persians in a naval battle because they thought building a wall across the Isthmus of Corinth was the better way to protect themselves. The Athenian commander, Thermistocles, tricked the Spartans by sending a messenger, posing as a traitor, to tell the Persian a Greek attack was imminent. The Persians took the bait and moved up their timetable leaving the Spartans no time for withdrawal. Thermistocles knew that the Persian fleet was much larger than his own (1200 ships to 400) so he decided to use geography to improve his chances. The Salamis Island occupies the center of the Saronic Sea near Athens. On the east side of Salamis sits a pointed peninsula called Cynosura. The waters north of this peninsula were quite narrow – too small for entire Persian fleet. Themistocles reasoned that his odds of winning would improve if he only had to fight a fraction of the Persian fleet. He formed his fleet into a line and placed it running north to south against the eastern coast of Salamis Island. To oppose him the Persians were forced to create their own line on the Attican side of the bay. The Persians attacked early in a September morning but the battle quickly became a rout in favor of the Greeks. Many of the Persian ships were pushed back to Attica where they ran aground. Others, trying to escape to Phalerum (a bay near Athens) were cut off by an Aeginetan squadron and destroyed. 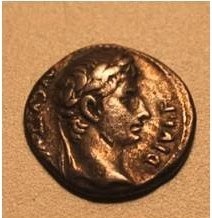 Defeated, Xerxes chose to withdraw his main army from Greece and leave a small force to winter there. Those troops lead by Mardonius camped at Boetia, far enough from Athens to allow its citizens to return to their ruined city.